If you’re looking for a high-performing flashgun that boasts a variety of cutting edge photographic features, our range of Canon flashguns is the best place to begin your search. Built around a diverse array of products, our Canon range contains everything you need to ensure your photographs come out exactly as you intended. Designed with ease of use in mind, a Canon flashgun is a highly portable piece of technology that’s suitable for both beginners and experts alike. With flashguns that incorporate swivel, tilt, and swivel & tilt motion technologies, it’s easy to find exactly what you’re looking for. Customers can take a look at Canon flashguns that operate with a range of up to 30 metres, have accurate flash metering capabilities, and utilise ratio control technologies. This technology encourages a more creative approach to flash photography by offering the user the ability to control the output of light emitted over a series of flashes. 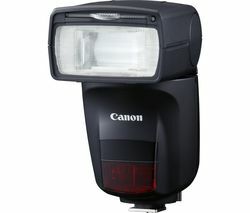 One of the most popular products in the Canon range, the Canon Speedlite 430EX III-RT III Flashgun, is the perfect illustration of the manufacturer’s commitment to high quality, affordable camera technology. With a clear digital screen and intuitive control mechanism, it’s a great piece of kit to incorporate into your existing setup. Bundled with a bounce adapter, two cases, colour filter, and one year manufacturer’s guarantee, it’s the complete package. However, our photography range doesn’t stop with flashguns. Whether you’re looking for cameras, a tripod, cases or lenses, we’ve got what you need. Ideal for both the amateur and professional photographer, we stock a variety of products that cater for all budgets and tastes. Also available are a number of photographic products for use with other types of camera. Customers may want to see our selfie stick range, check out our instant film cameras, or browse our photo albums.